Almere ( [ɑlˈmeːrə]) is a planned city and municipality in the province of Flevoland, Netherlands, bordering Lelystad and Zeewolde. The municipality of Almere compromises 6 official districts and boroughs. These are the districts Almere Stad (which is further split up into Almere Stad Oost, Almere Stad West and Almere Centrum), Almere Buiten and Almere Pampus (which is currently being designed), and the boroughs of Almere Haven, Almere Hout and Almere Poort. 4 of them also feature official district/borough offices. 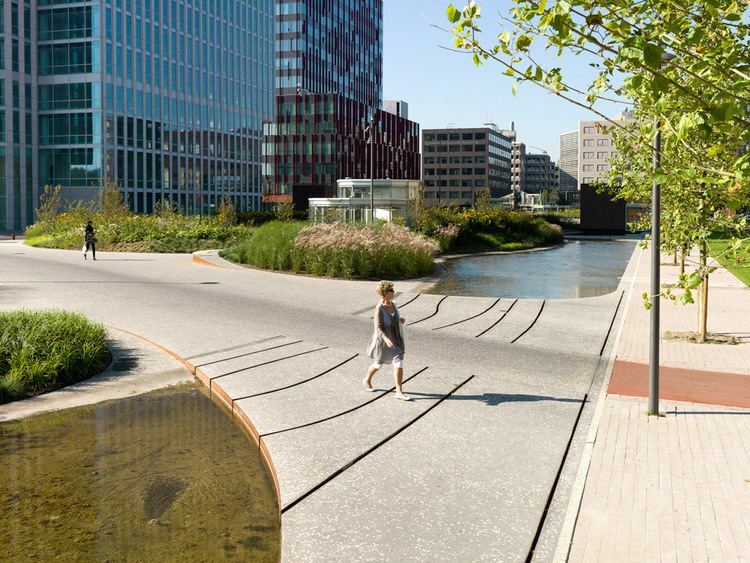 Furthermore, it also compromises of the unofficial historic district and neighborhood Oostvaardersdiep, which has an active semi-self-governing community, and the planned district of Almere Oosterwold. 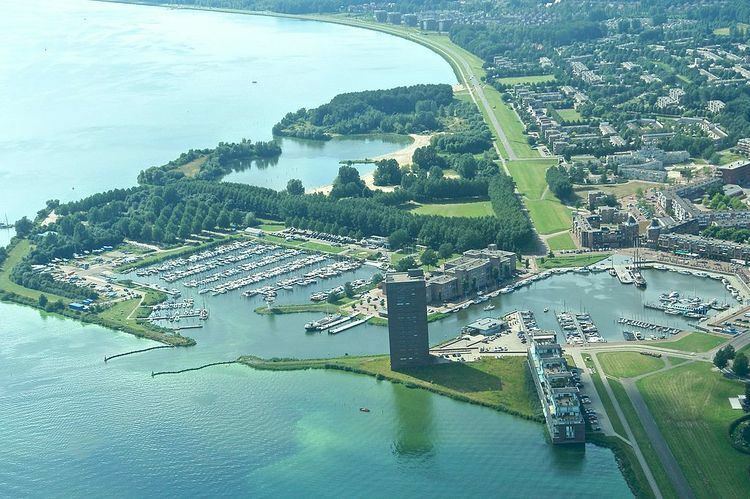 Almere is the newest city in the Netherlands: the land on which Almere sits, the Southern Flevoland Polder, was reclaimed from the IJsselmeer in 1959-68. The first house was finished in 1976, and Almere became a municipality in 1984. It has the largest population of the municipalities in Flevoland with 196,290 citizens in 2017 and the 7th largest in the Netherlands. In October 2007, the city council of Almere made agreements with the government to expand the city to 350,000 inhabitants by 2030. The original plans for the IJsselmeerpolders saw the land being used for agriculture. However, after World War II housing was needed for the rapidly growing population of Amsterdam and two towns were planned in the polders Oostelijk Flevoland and Zuidelijk Flevoland. The town in Oostelijk Flevoland became Lelystad. The town in Zuidelijk Flevoland was still called Zuidweststad (English: South West City) on the first sketches, but in the 1970s it became called Almere, named after the lake Almere, the early medieval name of the Zuiderzee. The first house in Almere was finished in 1976. At that time the town was still controlled by the Openbaar Lichaam Zuidelijke IJsselmeerpolders (Z.IJ.P. ), with a Landdrost. In 1984 Almere became an official municipality. Originally, Almere was envisioned as a town with multiple centres. This idea was later abandoned in favor of allowing neighbourhoods like Tussen de Vaarten to be built. There is also a difference between the way houses are built in the oldest and the newest parts of the city. The housing plan in Almere in the 1970s was basic functionality and a levelling of social status. However, starting in the 1990s more exclusive homes with striking designs were built (e.g., in the Regenboogbuurt). Franc Weerwind (D66) has been the mayor of Almere since 9 September 2015. On 20 May 2010 the new council was inaugurated. The populist Party for Freedom had won the most seats in the local elections, which was both national and international news due to the controversial statements of its leader Geert Wilders. Even though the largest party they didn't take part in the local administration. The first local council was installed on 2 January 1984 in the presence of the then minister of the Interior Koos Rietkerk. The council elections took place on 21 September 1983. Prior to 1984 Almere had an Adviesraad, which was chosen every 2 years (1978–1980, 1980–1982, 1982–1984). This Adviesraad was made up of different political parties similar to a local council. On 11 March 1977 the first adviescommissie was elected. It consisted of 5 people that were chosen on personal title. Since 1998, the council of Almere has comprised a total of 39 members. Almere is located in the polder of Southern Flevoland (Dutch: Zuidelijk Flevoland). It is the most western municipality of the province Flevoland. It borders with Lake Marken in the west and north, Lelystad in the northeast, Zeewolde in the east, and Lake Gooi in the south. Almere consists of three boroughs and three districts (Dutch: stadsdelen), three of which are under construction. 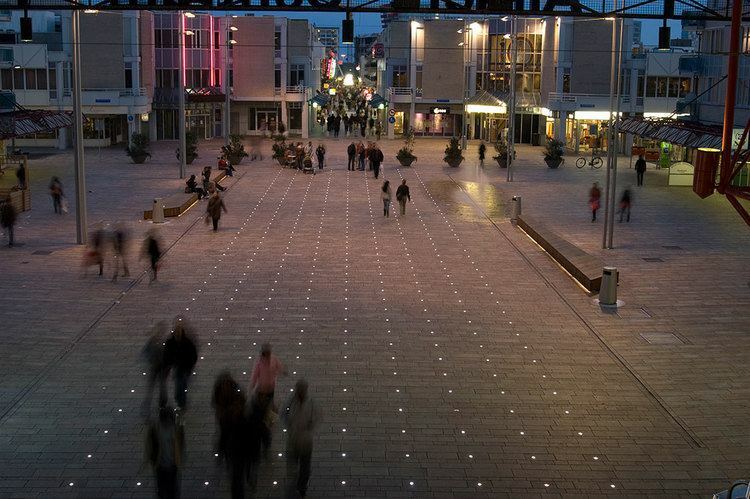 Almere has an oceanic climate characterized by mild to cool winters, and warm summers with fair precipitation year-round. Almere is the home of Almere City FC. The traffic infrastructure in Almere is recognisable because of its separate infrastructure for cycles (which, in most cases, have separate cycle paths), cars and buses (the buses drive on a separate bus lane in most parts of the city). Almere is connected to the motorways A6 and A27. In 1987 Almere was connected to the national railway system (see NS) with the fully completed Flevolijn which connected Weesp to Lelystad Centrum. A seasonal-use station, Almere Strand, was set up for certain events, such as Libelle Zomerweek. The station was made up of iron platforms. 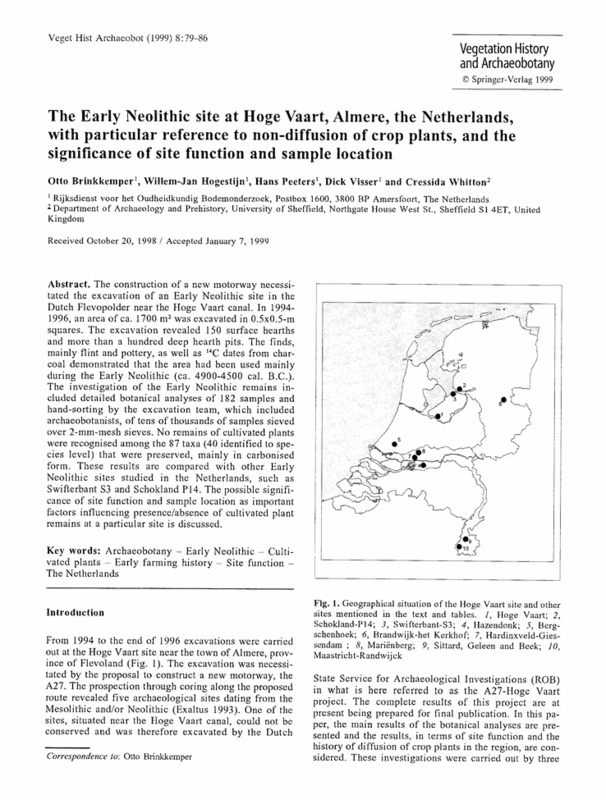 It was opened in May 1996 under the name Muiderzand. The station was closed after June 1996 but re-opened in June 1999 under the name Muiderstrand and closed again in July 1999. It re-opened again in 2001 under the name Almere Strand as an official seasonal-use station, meaning it was now open certain seasons every year. Because of the rapid development of the adjacent borough Almere Poort, it was decided to open an official station there (see Almere Poort), thus making the station of Almere Strand obsolete. Almere Poort station opened on December 9, 2012. Therefore, Almere Strand station was officially closed just after the summer of 2012 and its iron platforms were torn down in the weekend of October 6–7, 2012. There are no remains of the station, although passengers can still see where the platforms once stood from the windows of Flevolijn trains. Monday to Friday, most city buses run about every 7,5 minutes (8 times every hour) during daytime hours. Saturdays, only a few city bus lines run every 7,5 minutes during daytime hours; most of them run every 12–15 minutes. Sunday, almost all city buses run every 30 minutes (with some buses running extra runs during certain hours), except for line 1 which runs every 15 minutes during daytime hours (every 30 minutes outside of daytime hours). There are a few overnight bus lines (Friday and Saturday night only): N11, N12 and N13. They run under the Connexxion internal name Niteliner (but are operated by Maxx Almere branded city buses). The bus company running almost all buses is Connexxion. Local buses (city buses) run under the name Maxx Almere. In the buses one can use the national transportation chipcard (smart card), subscriptions or one can buy bus tickets of Maxx Almere in the bus or at TVM's (the latter only Downtown). Starting December 10th 2017 all local buses will be operated by Syntus under the allGo brand. Besides the local bus lines, there are regional and rush hour bus lines to towns and cities in the area. Line 159 is operated by the bus company OV Regio IJsselmond. Line 322, 327 and 328 are operated by Connexxion using the R-NET branding and concept. There's also an overnight bus (Saturday night only) from Amsterdam to Almere Haven Centrum (N27). It start at Amsterdam Leidseplein. From there on, it uses the route that line 327 uses during daytime hours/early evenings. It only runs one way (only from Amsterdam to Almere Haven Centrum). Since April 2012, there's a rush hour bus line, 150, to Utrecht which connects Almere directly with the University Area of Utrecht called De Uithof. (This was previously done by former bus line 295). Due to budget cuts, line 150 was scrapped on July 9, 2016.